The coolest connected toys of 2015 are back for round two this fall. Sphero has just rolled out (sorry) the similar BB-9E and the even grander R2-D2 (follow-ups to its delightful app-controlled BB-8), and now Anki is back with a new edition of Anki Overdrive—this time with the blockbuster Fast & Furious film license attached. It’s such an obvious fit, pairing the explosive action of the smash movie series with Anki’s speedy connected cars, and the familiar rides from this year’s The Fate of the Furious fit in perfectly with Overdrive’s existing supercars. By and large, the addition of movie branding doesn’t result in massive changes to the two-year-old experience, but it brings a little more personality and pop to the still-fun experience. At its core, the Fast & Furious Edition ($169.99 MSRP; same price on Amazon) is very similar to the original Anki Overdrive, and the starter kit provides much the same kind of core experience as before. 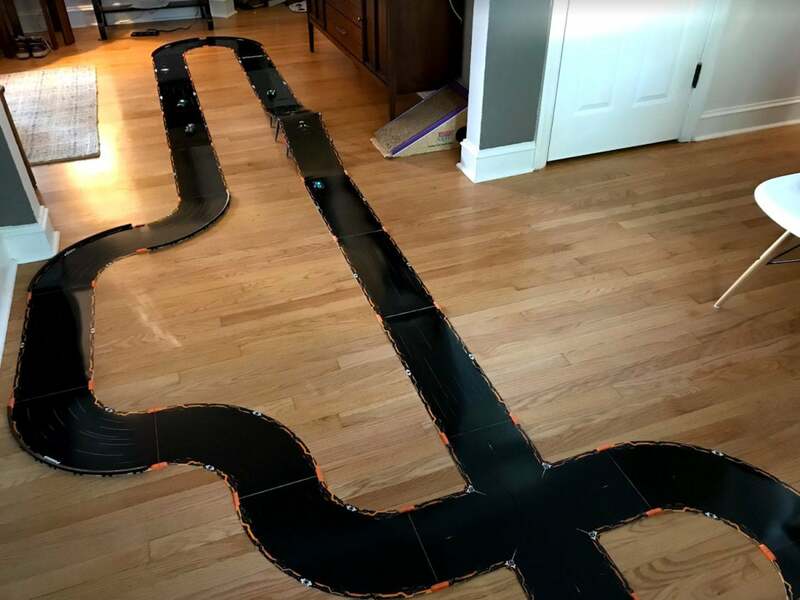 It’s an all-in-one bundle that lets you build a number of different race tracks, race and battle with friends or against computer-controlled opponents, and use your iPhone, iPad, Android device, or Amazon tablet to control the action. And all of this stuff is compatible with all of the old track and cars, too. The box has everything you need except for an iPhone or iPad. Inside the bundle, you’ll find 10 pieces of track (four straight pieces and six curves) and two cars, as well as a charging station and a sticky-surface tire cleaner to help the little vehicles maintain traction and stay on track. And there’s something else to help with that: snap-on guardrails for the outside edge of the curved pieces. That was one of my biggest gripes from the previous version, as Anki previously only sold them separately. 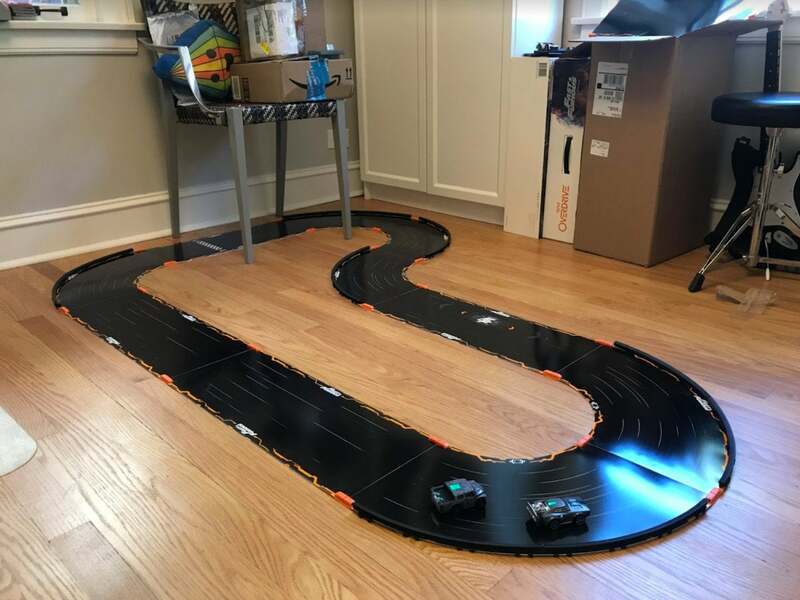 Getting set up is a breeze: the ultra-thin plastic track pieces snap together effortlessly with a magnetic click, and you can build eight different designs from the segments found within. It even has a couple of risers so you can have a chunk of the course loop over another part. Once your course is constructed and the cars are charged up—that takes less than 10 minutes, giving the cars about 20 minutes of drive time—you’ll turn to the app for the rest. It takes mere moments to set up a quick track like this. From the app, you’ll choose what kind of event to play, whether you’re completing missions in the Campaign or just facing off against local friends and family members with their own devices. And then you’ll use your iPhone or iPad to drive your car: the Anki vehicles are semi-automated, so they’ll lightly accelerate and take turns on their own, but you can tilt your phone or tablet to shift lanes, speed up and brake as desired, and even fire off virtual weapons to slow down or spin out foes. It’s very much like Super Mario Kart, albeit with real toys firing off and reacting to unseen digital attacks (the visual explosion seen in the top image isn’t real). Some events make racing the top priority, while others are focused on who can land a certain number of attacks first—there’s some variety in the mix. What does the Fast & Furious franchise bring to the table? Well, the cars are the most obvious addition: Dominic Toretto’s Ice Charger and Luke Hobbs’ International MXT are pretty similar to the rides seen in The Fate of the Furious, albeit with a more of a cartoonish touch to match Anki’s otherwise bespoke toy vehicles. It would’ve been great to see some of the other flashy rides from earlier films, especially from back when the series still focused on brightly colored tuner cars, but these will do the trick for now. The Fast & Furious cars (middle) fit in well enough with Anki’s own creations. All of the track pieces have a Fast & Furious logo along the edge, but one straight piece has something more: a special “Power Zone” area. If you drive over that first while other cars are nearby, you’ll “hack” them—which means they’ll slow down significantly, giving you a chance to speed ahead. Likewise, the other cars can do the same to you, even if they’re computer-controlled, so it adds a new strategic element to the experience. You might have a reason to hit the brakes and stay back for a second, lest a rival driver force you into it instead. Furthermore, the new Anki Overdrive: Fast & Furious Edition app is fully movie-themed, with hand-drawn renditions of familiar characters like Dom, Letty, and Tej, all with voice clips that either come from the real actors or very convincing sound-alikes. 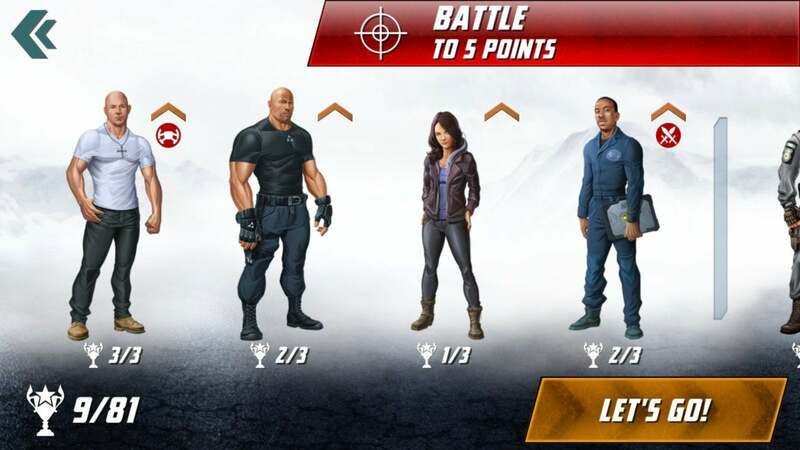 You’ll face them alongside other generic opponents in the Campaign mode, which finds you racing or battling it out with weapons as you progressively unlock new missions and in-app car upgrades alike. You might recognize these people. And if you have one of Anki’s larger Supertruck vehicles ($59.99 a piece; same price on Amazon), the Takeover play mode is a pretty perfect fit for the movie franchise: it finds you battling other cars to try and take control of the semi truck and win the match. I didn’t have a Supertruck to try it out, unfortunately, but it might be worth the extra cash to add one if you and your family become deeply invested in Anki Overdrive—and/or want to reenact some movie scenes in your living room. 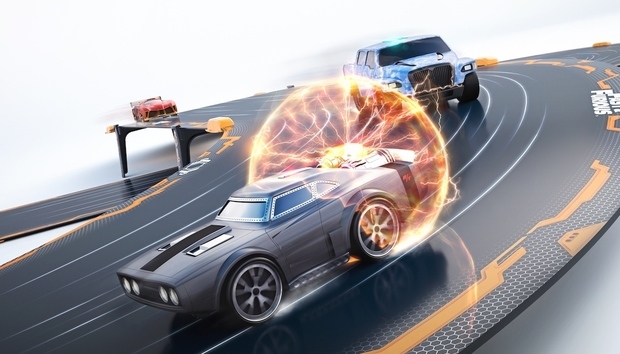 “Deeply invested” is a key phrase here, because like the main set, Anki Overdrive: Fast & Furious Edition can be extensively expanded with additional track pieces, extra cars and trucks, and even special stunt pieces. But it’s all pretty pricey: two extra straight or curved pieces will cost you $20 per pack, while the plus-sign-shaped Collision Kit piece is $30 on its own. Anki also has enormous add-on bundles ranging up to $380, and that doesn’t include a starter kit. Adding more track opens up a lot more possibilities for course designs, and lets you create sprawling, inventive playgrounds for your cars to zip around—but as I discovered the last time around, the cars seem less able to stay on the track as it encompasses more and more pieces. The Launch Kit ($30) in particular, in which the cars attempt to vault over a fairly small gap, is the worst addition of all. I couldn’t get the Fast & Furious cars to do anything but fall over the edge and try to drive under the other piece of track. More isn’t necessarily better with Anki Overdrive, as appealing as that might sound. Two starter kits plus a few extra pieces, and the track’s so large it won’t fit in the photo. Even if you stick with the starter kit, there are still recurring annoyances. Cars that find their way off-track—even with the new guardrails—rarely find their way back, and they can’t do anything if they’re stuck up against a rail, spinning their wheels endlessly while on an orange magnetic connector, or manage to flip upside down. You’ll still spend a little too much time babysitting the cars, which can be squirrelly at times and often get spun around and start driving the wrong way. They’ll eventually auto-correct and turn around, but you’ll lose some progress in the race. All told, these annoyances pile up as I’m frequently forced to get up and reposition cars to keep the race going. 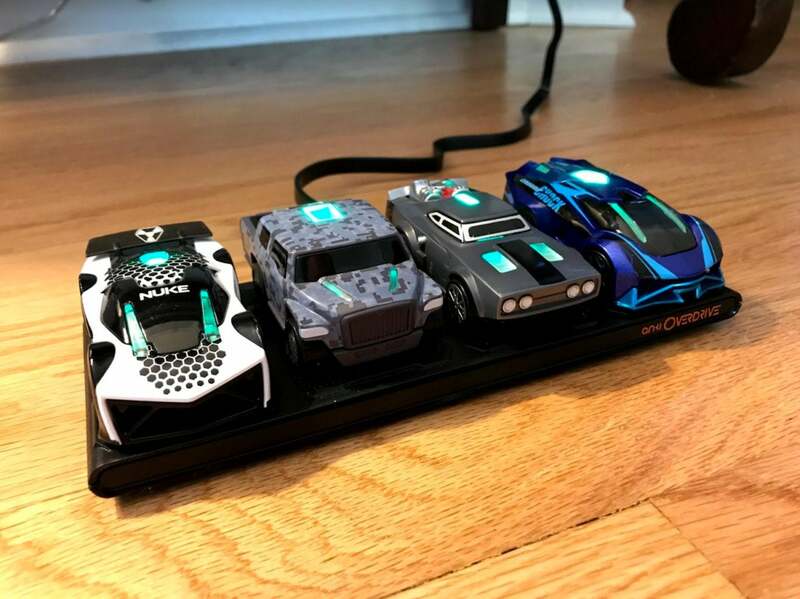 On the other hand, my four-year-old son—who first loved Anki Overdrive when he was two, and still calls them only by the name “car mats”—thinks it’s hilarious. So your mileage may vary. Overall, luckily, the concept of Anki Overdrive is just far too cool to be ruined by those little, albeit recurring hitches. It’s slot cars for a new generation, with little battery-powered sports cars that zip and zoom at your command, using your smartphone and an extendable track that you can customize to your heart’s delight. Sure, the add-on elements are costly and inconsistent, but you don’t need them. Even at $20 more than last time, the $170 starter kit still feels well-priced for how much you get, and for how extensive the app experience is. The Fast & Furious contributions aren’t dramatic; super-fans who have all eight films in their home collection don’t necessarily need to rush out and buy this solely for the license, but it’s really only a positive component. It adds a little more character and excitement to the fun, while the familiar cars and the new Power Zone are nice additions. I’d recommend this version over the vanilla Anki set, unless you specifically dislike the films. And if you already have Anki Overdrive and you’re still actively enjoying it, or eager to give the experience a shot in the arm, then it might be worth adding the Fast & Furious Edition. It’ll be a pricey upgrade, essentially, but the extra track and cars offer a lot more options, the guardrails are a welcome bonus, and the new app experience serves up enough new challenges to potentially justify the investment. 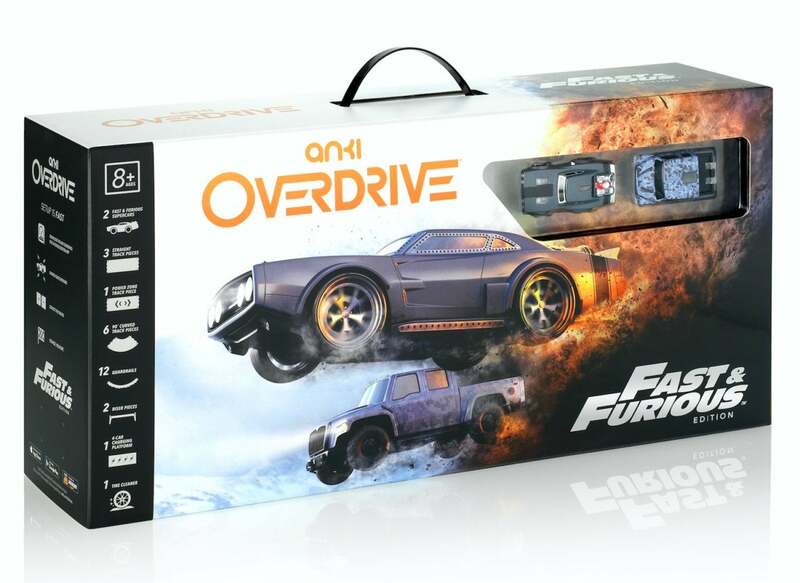 The Fast & Furious Edition may not be a brand new Anki Overdrive, but with the right license and a couple of tweaks, it feels fresh enough to warrant another look this holiday season.